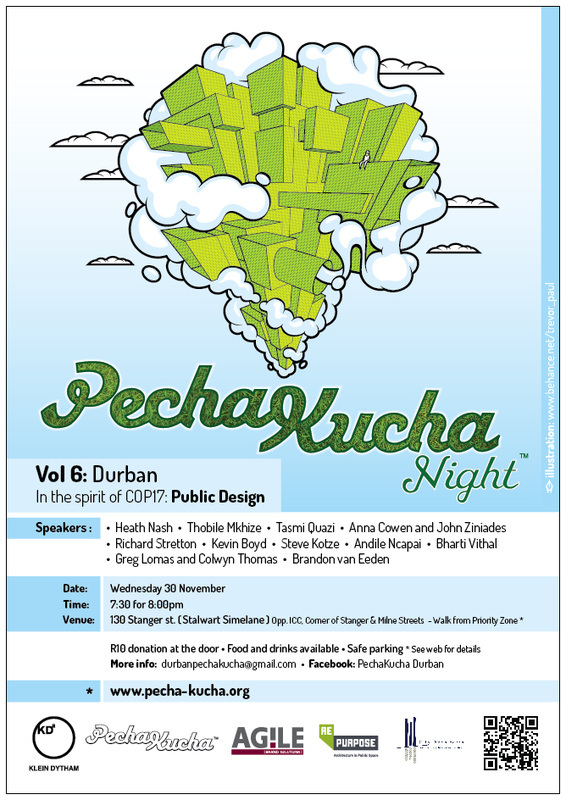 _PechaKucha and the Priority Zone, Durban have teamed up to bring you an evening of exhibitions, presentations and conversations on Wednesday 30 November 2011. Starting off with exhibitions and food at the Priority Zone, you’ll then be invited to take a short walk through the COP 17 festivities to the PechaKucha: where a line-up of speakers will inspire within the realm of public design. Start your evening off at the Priority Zone building for 4 unique exhibitions. Check out the rooftop gardens; explore ideas around repurposing urban space and buildings; all while feasting your eyes on work from Sao Paulo, Durban Priority Zone, Durban City Architects and the International Union of Architects. At the 6th Volume of PechaKucha Durban speakers will get 20 slides and 20 seconds per slide to unpack the theme: Public Design. The high-tempo pithy presentations are set to wow and inspire as the speakers from diverse backgrounds each give their own unique take on public design. Drinks will be on sale. We suggest you park at the Workshop / BP Building / Off Stanger St at Milne/ Hunter/ Morrison Streets (the whole zone will be secure and walkable) and make your way to the Priority Zone building at 77 Monty Naicker Rd. There will be a few traffic changes in the ICC area so allow some time for this too!